We now happen upon one of the few instrumental tunes featured during this year's Culinary Christmas. It's The Nutcracker Suite by the Appalachian Christmas Quartet. Given that this is based on "The Dance of the Sugar Plum Fairy", the way I see it, we get both nuts and sugar plums out of this song that has no words. 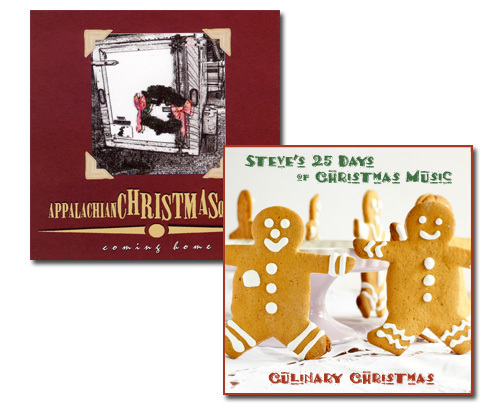 You'll hear dueling mandolins, mandola, mando-cello, and a flute in this rendition by the group, who isn't a stranger to Steve's 25 Days of Christmas Music. We previously featured "Gloria" in 2004 during our Wordless Winter Wonderland theme… and then later in 2008 showcased "Angels We Have Heard On High" as part of a pair of songs in our Dueling December Ditties. They are one of our favorite Christmas bands. While you are sitting here reading, might I point you over to our sister site MagicalTrash.com, where I document the various trash cans of Disney theme parks and resorts. Go take a look! Speaking of Disney, yesterday was my father's birthday… which I documented on our personal blog SteveandAmySly.com by posting a video from our 2009 birthday celebration at Walt Disney World. You might even learn something about the Birthday Fastpass!